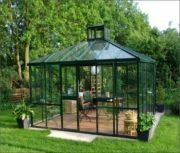 The Victorian Greenhouse has not only improved on the overall design of this style of greenhouse, they have improved the internal growing environment, and done all of this at a better price than others. 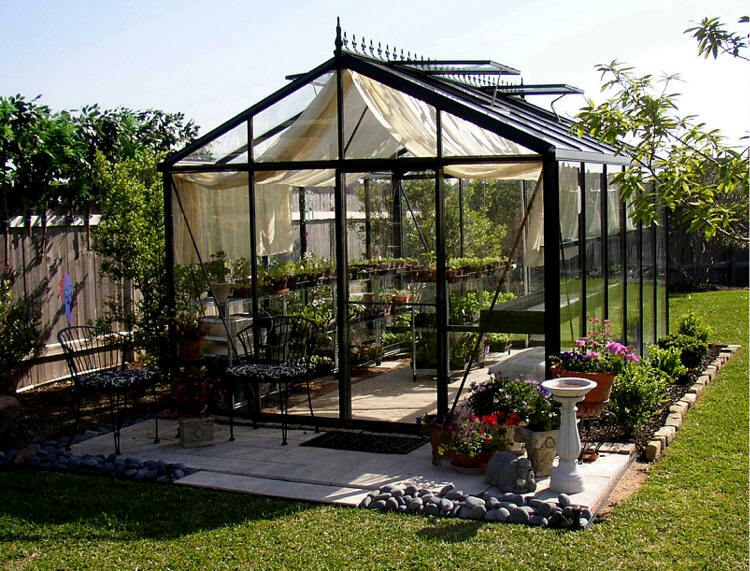 This classic Victorian Greenhouse kit provides the optimum environment for gardening year round while adding a stately presence to any backyard setting. The dark green aluminum framework, tempered glass panels and full 6' 7" wall height combine to give you a comfortable interior workspace and a full view of your surroundings. The overall height is 9'2" feet. Whether you are overwintering special or valuable plants from the cold, starting seedlings or creating a tropical jungle, you can enjoy years of maintenance free use with this fully loaded kit. 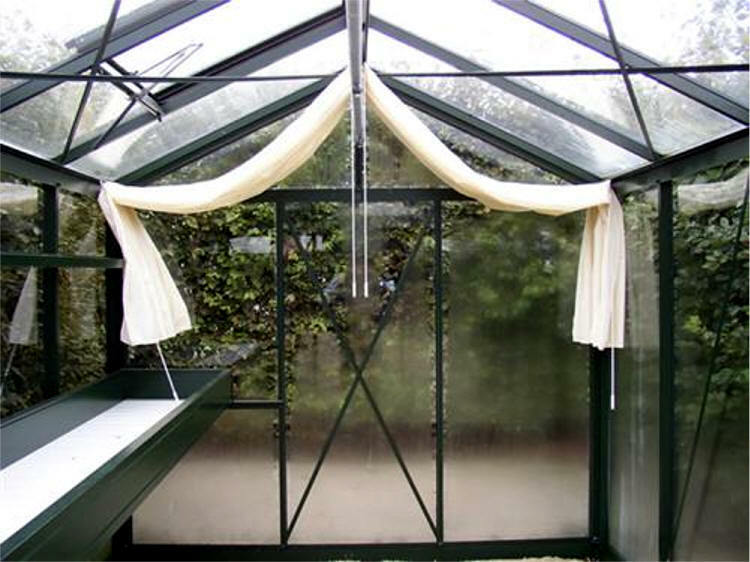 Our automatic roof openers, built in misting system and interior shade net sections allow you to control the environment within the greenhouse to your specific needs. #VI34 Optional Accessory Kit: 1 narrow top shelf (15' long x 4" wide); 1 seedtrays shelf (15' long x 20" wide x 4" deep), 2 sets of 10' length shade curtains. The high-quality profile system guarantees a long life and excellent stability. Hinged profiles allow different roof shapes. 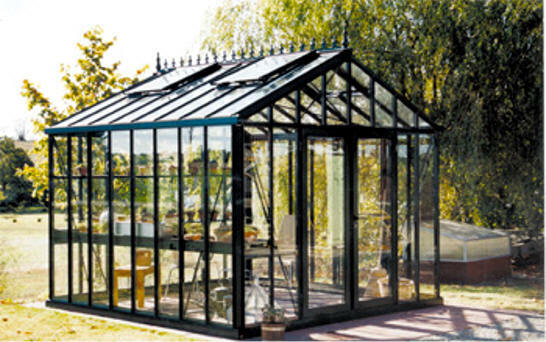 Our Victorian glass greenhouses have been designed with a long life and carefree usage in mind. They meet the requirements of the most demanding gardeners and retain their value for many years. Helios is available in various designs with a wide choice in glazing and numerous well-thought out accessories. 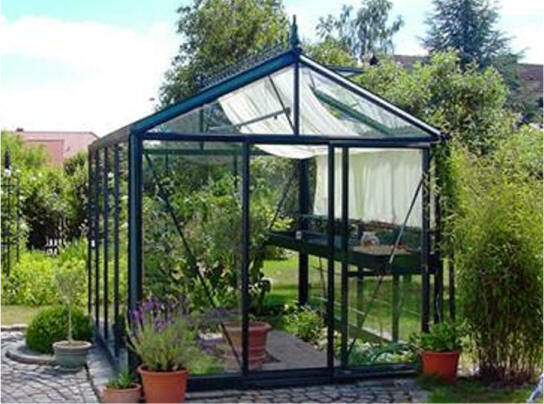 Therefore making these greenhouses ideal for a wide range of applications. Whether you are growing vegetables or flowers or need a frost free over wintering spot for your valuable cacti or orange trees, our greenhouses always offer a solution that perfectly meets your needs. 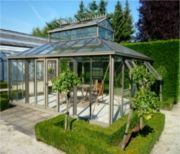 The standard equipment includes stainless steel bolts and nuts, draught strips on the door, rubbers on the windows, a drain (40 mm cross-section), condensation gutters on the inside of the gutter profile, foundation profile, sprinkling, one sliding door and one or several skylights, depending on the model.